UPDATE: Turns out the NFL has done a decent job of making it up to fans. Better than we thought when this post was originally written. EARLIER: The biggest gaffe of Super Bowl XLV was not Christina Aguilera’s anthem flub — it was the NFL’s decision to sell hundreds of tickets to seats that were not built or secured in time for the Big Game. As a result, 400 fans holding $900 face value tickets were not allowed to watch the Super Bowl. The league blames the fire marshal, but they real culprit was greed. 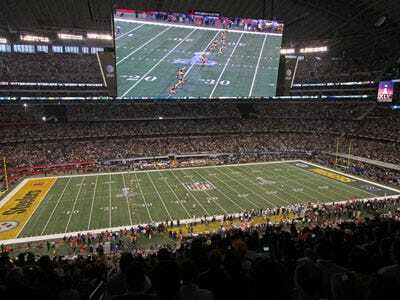 Cowboys Stadium is one of the biggest stadiums in the NFL, but that wasn’t enough for the profitable sport in the world. The NFL had to pack every available inch of the building with seats and when that wasn’t enough, they charged people to stand outside and watch the game on TV! And fans paid it, because they love football so much. Too bad football doesn’t love them back. And these are the real fans — not corporate executives cutting million dollar deals in the luxury suites who couldn’t care less about the outcome. Notice that all the folks in this video are wearing jerseys and hats and coats and carrying souvenirs. These are the people who drive the NFL’s gargantuan revenues and even after the league takes away their football with a lockout next season, they will come back to take even more abuse. The NFL needs to do more than give refunds and free soda. That was just a start. The 400 people affected by this nonsense should get their refund. They should also get tickets to the NEXT Super Bowl. And not cheap bleacher seats. 50-yard line. Box. Oh, and hotel rooms. (It’s Indianapolis, shouldn’t put the league out too much.) And airfare. And throw in a couple of $13 popcorn buckets. These 400 fans should get the best Super Bowl experience that anyone has ever had next year, and it shouldn’t cost them a dime. You want to thank the fans, NFL? The fans you claim to love so much that you’ll take away an entire season to “defend” them? You need more than the Fonz. Put some of that revenue you save from the new CBA and take care of these fans. Take care of them and you’ll be taking care of disappointed fans everywhere.